When talking IoT and digital connectivity to a data management professional, especially the sales variety just watch the body language. For them it means data centres, hybrid cloud, virtual machines, hyper-converged systems, in short, revenue. For most consumers, though, Internet of Things is still science fiction, except that when you stop to think of it, it’s already happening, as recent news articles about self-driving cars is proving. 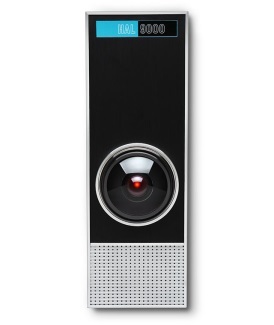 Personally, I’m still wondering why, in 2016, we are only just getting round to making a refrigerator talk when Arthur C Clarke and Stanley Kubrick teased me with Hiltons in space, cool looking space clippers, Moon habitation and manned flight to Jupiter in their epic 1968 science fiction film 2001: A Spaces Odyssey. OK, so maybe Sci Fi writers of the period couldn’t have predicted events such as the 1973 oil crisis, the fall of the Soviet Empire, Pan-Am’s bankruptcy, AGW (Anthropogenic Global Warming) and so on, or maybe they could but thought better of it. The fact is, smartphone owners are only just getting used to their favourite health app textually suggesting they take the stairs instead of the lift. We are still at that stage where we would probably freak out if the fridge called us up in supermarket to say that, you’re out of milk and butter, and as you’re at the Dairy counter, you’d better take some more. The thing is, while most consumers are trying to grasp the concept of health Apps verbally engaging them – imagine the scene, “Dave, should you really be putting cream in your coffee? You haven’t achieved any goals recently – the data industry is upgrading its infrastructure – cue for a discreet plug – and shrewd marketeers are researching ways of monetizing some very insightful data, data protection laws permitting. OK, so maybe it’s because I didn’t get my trip in a super space clipper, yet, but, while I get Smart TVs, when I read the hype around some other digitally connected appliances I can’t help being dubious. Plus on top of that and perhaps because I work in a data management and globalization strategy environment, I have no illusions about how Marketeers use the valuable insight gained from cozy chats in front of a semi-intelligent but perfectly receptive TV. There’s a whole new industry developing to cover the Zettabytes of global data available today, an industry offering data management, collection, transmission, storage and analysis solutions. Take Amazon as an example. What started as a simple online retail business, in 1994, morphed into a completely independent, self-sufficient, sector-disrupting supply chain offering everything from Prime TV, fresh fruit & vegetables, vinyl records to cloud services and data management facilities (I’ll skip the space travel bit). And you know what? I can perfectly live with the thought of Amazon, plus a few select others, retrieving my data but I balk at the thought of Facebook doing the same! Irrational, isn’t it? Well no, I can handle Amazon’s redundant Ad suggestions based on items I purchased recently because, even if they have categorized me by purchase type, wallet, Geo location etc., I have something to show for it, whereas with Facebook, well read on. Still have doubts how clever minds quickly find ways to monetize an activity? Think about this next time you’re looking at those carefully engineered Ads that appear on the right of favourite social media webpage, before you even click “Post”. If sharp minds could create high-frequency, nano-second algorithmic trading and disrupt the Stock Market just imagine what some equally sharp mind could think of to bring advertising to you via your digitally connected e-devices. Soon high-frequency nano-second adverts will be punctuating, real-time, communications between the fridge and your smartphone, offering you special promotions on selected products at the milk counter you just walked past. Surprised? Well you shouldn’t be, product packagings have RFID chips containing data fed in by the producer. Imagine the scene: a shopper with a smartphone and a certain App installed on it walks past a specific product, the product’s RFID chip alerts the smartphone App and a “Take two, Pay one” e-coupon pops up on your smartphone screen, clever, huh?… Extreme Couponing just changed playing field. This entry was posted in Everyday life, IT & Computing, Society and tagged AGW, data centres, Hilton, Hybrid cloud, hyper-converged, Prime TV, virtual machines. Bookmark the permalink.